The setting is the Britain's Falkland War, Task Force heading back to England during 1982. On the HMS Invincible carrier deck, Harrier pilot and a carrier crew seem to farewell to Falkland Island while everyone is looking busy on their carrier work. 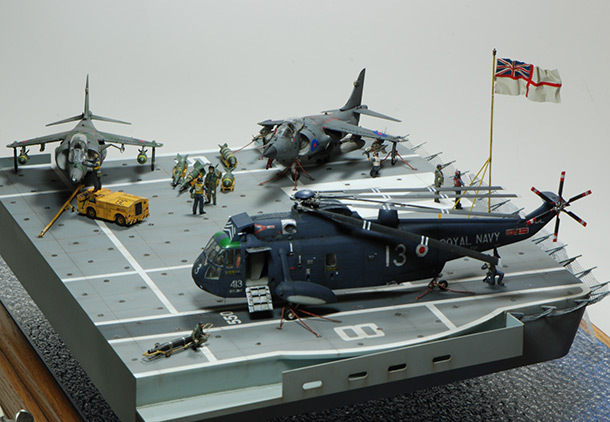 Diorama is a Laser cut out Carrier deck from scanned Dragon 1:700 instruction sheet, than cropped the tail carrier section which only enough to cover 2 Harrier, and a Seaking chopper, than scale it from computer in Auto CAD form. After that, 2D laser score all necessary text and line, than cut out the out line on a 3mm thick Plexi-glass. Both Harrier are Hasegawa and Seaking from Fujimi. Figure are Italeria Nato crew and Tracker from Verlinden, all Bomb rack and tow bar are scratchbuild. Humbrol and oil for painting. Ох и поплатятся "арджи" за своё "Мальвинас Аргентинас"!